Property Management Services In Memphis, TN by Enterprise Property Management, Inc.
Are you looking for a property management company to manage your Memphis area rental home? Enterprise Property Management, Inc. (EPM) is a Memphis Tennessee based residential property management company providing property management services throughout Memphis TN, Shelby, Fayette & Tipton Counties. Our friendly staff will work with you and will offer an honest and candid assessment of your Memphis area property’s rental potential. We will provide a realistic review of what you could expect from our property management services. Whether you live in Memphis or the other side of the world, Enterprise Property Management can help you manage your rental property. Enterprise Property Management is well established in Memphis and we believe our reputation speaks for itself. How will Enterprise Property Management market my property? Our leasing site located at www.epmleasing.com is the central engine for advertising your property. It attracts a huge volume of prospective tenants and is the core to which all other advertising media refers. It allows prospective tenants to search by location, home size, or rent range. Each property listing shows pertinent information about the property, including a description, photos of the interior and exterior of the property, a map of its location, and the ability to request an appointment online. This website is updated by our office staff multiple times a day, and offers a downloadable version of our tenant application, a sample lease agreement, and a link to our policies and requirements. As part of the management of your property, EPM will be out in the neighborhoods on a regular basis to show houses and to be sure that current tenants are caring for your property. 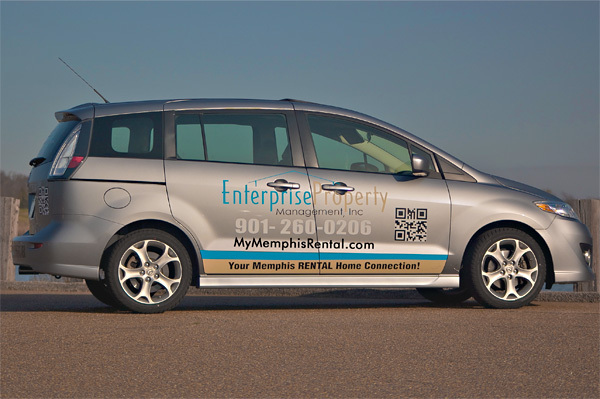 Our fleet of company vehicles sports the Enterprise Property Management, Inc brand, contact information, and even has QR codes that allow smartphone users to quickly scan and visit our website. Online advertising on several popular rental search sites. EPM offers a referral fee to any Memphis Realtor who brings us an approved client. Strategically located rental signs at the property itself for drive-by interest. EPM works directly with a third-party marketing agency. Their specialized approach to online marketing allows us to keep up to date with any market changes and to adjust our advertising purchase decisions accordingly in order to generate the greatest return on your marketing investment. The behavior of website users is monitored on an ongoing basis to identify trends that help us improve the overall user experience. EPM is proudly positioned in top 10 search results on all major search engines including Google, Yahoo and Bing for common search phrases used to find rental properties, and experience more than 90% of all new tenants originating from the Internet. Are you ready to get started with EPM managing your rental property? Find out today why so many rental property owners choose Enterprise Property Management to manage their real estate investment. © Enterprise Property Management, Inc. Licensed in Tennessee #258359 / 2002-2018. All Rights Rerserved. Thanks for your interest in Enterprise Property Management, Inc. We can’t wait to speak to you, so take a moment and give us a call! Reach out to either of the company owners, today! Bill Ivey, Founder and Co-Owner - 901-857-3888, OR Aaron Ivey, Founder, Co-Owner & Principle Broker 901-260-0206, ext 114!